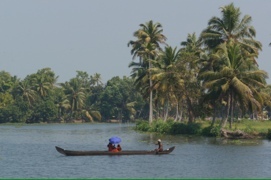 No trip around South India could be complete without a trip to the backwaters of Kerala, where the rivers meet the sea. 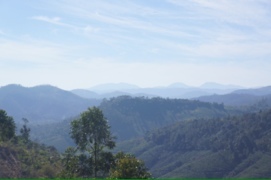 To get there, first we face another long drive through the tea plantations (oh the hardship!). 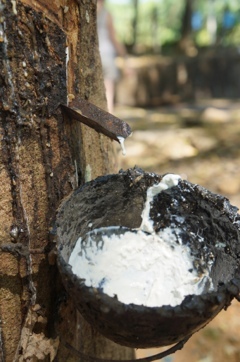 Along the way we stop at a rubber plantation, where sticky white latex is slowly dripping into coconut shell-shaped plastic cups (once they would have been actual coconut shells) from small cuts in the bark of the rubber trees. 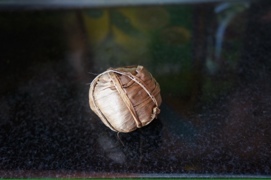 There is a refreshment stop at a roadside cafe which specialises in deep fried battered bananas stuffed with cashews, spices and raisins, and balls of date halva wrapped in banana leaves, as well as packs of bamboo rice, which is produced only once every 24 years and rumoured to cure just about everything, including impotence. 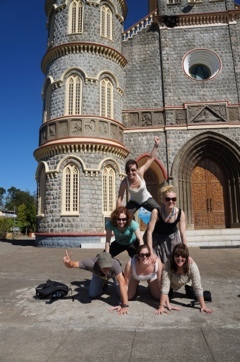 We stop briefly too at a Christian church sitting atop a small hill in the midst of tea plantations – the view is lovely, but more importantly I finally manage to convince the rest of the crew that our trip will be incomplete without a human pyramid – go the victory arm! Eventually we turn off the main road and down a rough unsealed road to a rather unsalubrious-looking settlement next to the river. There is time for a quick toilet stop (5 rupees and hold your nose, girls! ), then we board our craft for a one hour journey down the river. A row of plastic garden chairs has been placed on the upper deck, and the breeze as we cruise along is welcome – it’s becoming increasingly humid. All along the riverbank are cottages with steps leading down to the water. 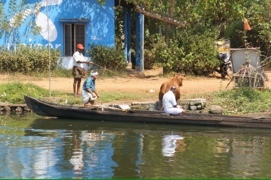 Women are washing clothes in the river, and a canoe pulls up to one set of steps to offload its cargo – a large brown cow, which miraculously disembarks without swamping the boat. It’s like being on a main highway – in fact there are road signs along the riverbank, and shelters like bus stops for shelter while waiting to hail a passing ferryboat. I’m told there could be as many as 300 islands in the backwaters, many on reclaimed land. We see men at work strengthening or rebuilding the stone walls along the riverbank – with global warming, rising tides and monsoon floods are having a serious effect here, though this section ends in a dam which prevents the sea and fresh water mingling as they once did (good for irrigation, not so good at flushing out the waterweed which is now becoming a real problem along the river). Behind the walls lie rice paddies growing the red Kerala rice. Along the river, that waterweed – water hyacinth, I think? 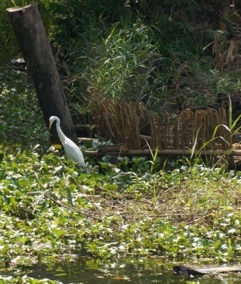 – grows in large clumps, providing floating platforms for kingfishers and cranes resting from diving for fish. 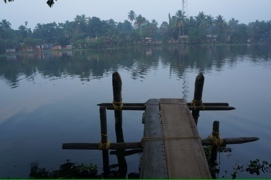 We turn into a smaller canal, and come to a halt at a small jetty in front of a farmhouse, the trees in front of the house leaning down to graze the water. We are staying in homestays tonight, three different houses, one of which is across the far side of the river. For those on this bank, there is lunch at a communal table, then one of the sons, Wishal (a former Intrepid guide who now works for a local charity) takes us for a walk along the riverbank and through the small village, showing us the different varieties of coconut palm and describing the irrigation methods used by local farmers to grow rice by immersion. A large canoe-like boat is waiting to take us back to the homestay as the sun sets, punted with a long bamboo pole. Dinner is served, a variety of curries (including my favourite pineapple), dhal and Kerala rice. Then the lights are dimmed, and a cake full of candles is brought in – one of the group turns 66 today! “Happy birthday” is followed by calls for another song, and the birthday boy proves to be an excellent singer as well – then it’s just like being in a tiny country pub in Ireland, as songs are called for from each of the countries represented – though I do feel that our host was copping out just a little bit by choosing the Indian national anthem. The next morning I am awake at six, and quietly let myself out the gate to go for a walk. The sky is just starting to lighten. 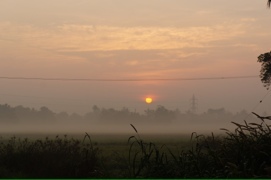 The air is still and quiet save for the birds, until the sun begins to rise, and the call and response of a Catholic mass can be heard from a church across the rice paddies. Then the mosque across the water starts, and the bells of the local temple. Back at the house there is time to sit on the jetty and watch the fish jumping (I’ll be breaking into song any minute now…), as the rest of the house’s occupants wake up and get ready for the day. 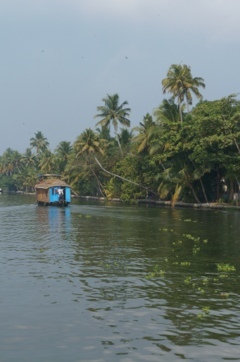 The boat is back to collect us for the trip to Alleppey, the main centre in the backwaters, where seemingly hundreds of traditional reed houseboats are docked awaiting passengers. Some of these boats are nothing less than floating hotels, complete with chefs, aircon, even a swimming pool on the more outrageously expensive boats, so that there is nothing left to do but sit back and watch the world go by. We say goodbye to one couple here, who are about to do exactly that on their very own houseboat. 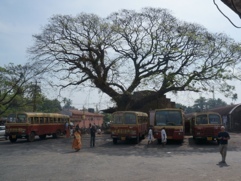 For the rest of us, there is a short wait at the local bus station before the crazy scramble, bags and all, to find a place on the local bus to Ernakulam. The bus is full, three to a seat, and the windows are mercifully barred rather than enclosed by glass – the driver is a frustrated rally car driver, judging by his pace, so there is quite a breeze as we make our way back to Fort Kochi and the final night of the South Indian trip.